Way back in the 1980s La Potinière in Gullane, East Lothian was the place to go for a gastronomic meal – you had to book months ahead to get a table (at one point their Saturday night waiting list was reputed to be two years long!) and I remember people saying that if you didn’t plan way ahead there was no point in even asking – this wasn’t always true, especially at lunch times or midweek but such was their reputation. We regrettably didn’t get the chance (or rather make the time!) to eat there while Hilary & David Brown were there … after 27 very successful years in the business they decided to move on. La Potinière is now run by Keith Marley & Mary Runciman.It still all looks wonderful & we still haven’t been. ( Not surprising though as we now live more than 1500 kms away ). 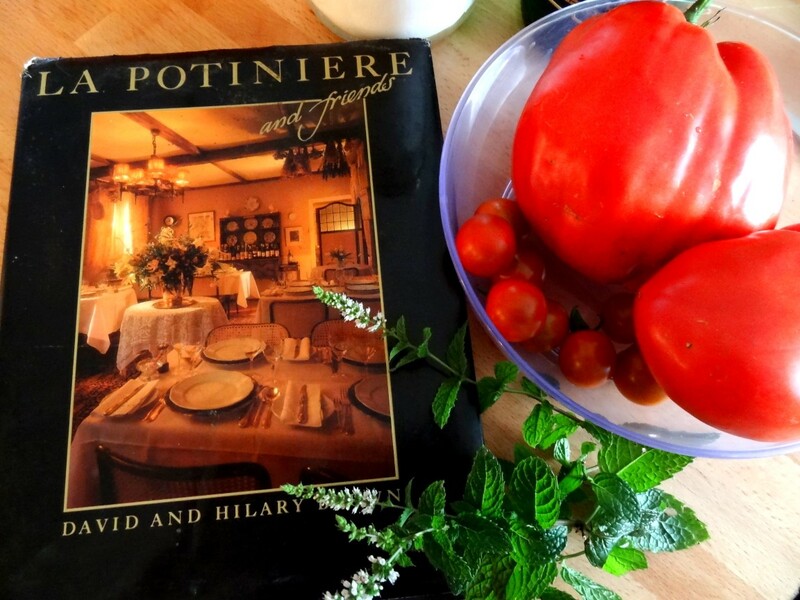 We still have the original well thumbed La Potinière & friends cookbook though and one of my favourite recipes is Hilary’s Tomato & mint Soup. With a glut of tomatoes in our vegetable patch at this time of the year I make lots of it to freeze & enjoy over the Winter. Melt the butter in a medium size saucepan. Add the onion & cook gently until softened but not coloured. Stir from time to time with a wooden spoon. 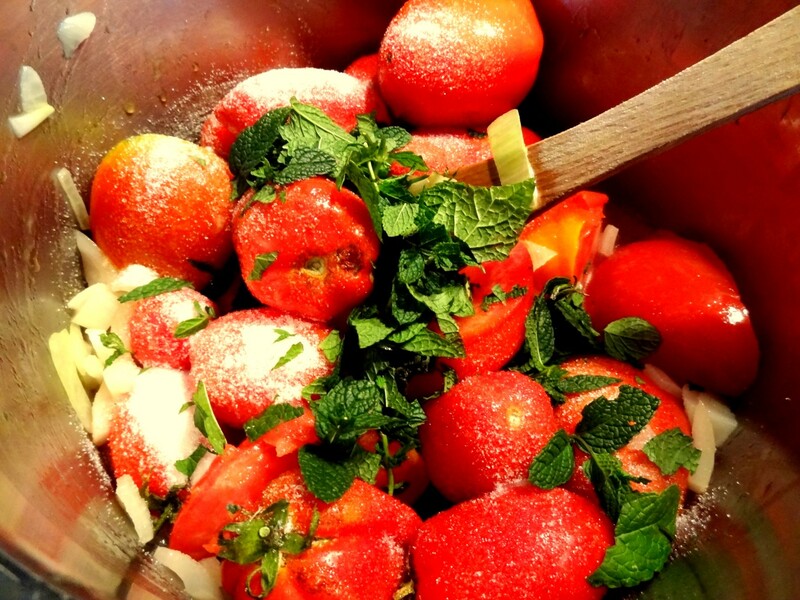 Add the tomatoes whole, with skins and stalks, the sherry, sugar & mint. No water is needed at this stage. Stir together, cover with a lid, then simmer for 45 mins to an hour. Stir occasionally. Ladle the mixture into a liquidiser & blend until smooth. Pour the soup through a mouli into the rinsed- out pan. Stir together, then add enough water to correct the consistency. Season to taste, about 1-2 teaspoons of salt. 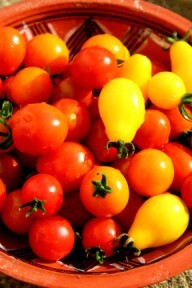 It should have plenty of body so don’t add too much water – the tomatoes should have created enough liquid. When you are ready to serve, reheat the soup and ladle into warm bowls. Garnish with a little lightly whipped cream & top with a sprig of fresh mint. We rarely have sherry in our cupboard as it’s hard to find here so I have made this soup with whatever has been lurking at the back of our fridge at the time ( within reason of course!!). White port, Tawny port and Madeira have all been successful but the best soup I’ve made was with a mixture of Marsala & something else which I can’t quite recall now….no matter, it should still be delicious!! We should try it, but we can’t get tomatoes like the ones just beyond your back door! Your recipe reminds me of some of those my mother has passed on to me where, rather than detailing measured quantities, she just says “a nice amount of….”. However she has, at least, usually been able to tell me what the ingredients are! I am normally a real weights & measures person when it comes to recipes Tim!! That said, as long as the right amount of alcohol goes in maybe what’s in the bottle isn’t so important 😉 If in doubt just use the dry sherry!! Aww thanks Fiona for those words of encouragement! Much appreciated!